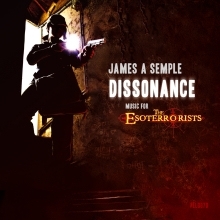 James Semple, sound designer and musician, offers you four new contemporary tracks for your Esoterrorists game, or any game of contemporary horror. The music here incorporates contemporary rhythms, electric guitars and sound design elements in addition to the expected orchestral and cinematic elements. The Esoterrorists Theme: This music has been written to introduce a session of the game. It begins by hinting at the mystery and horror using sound design and a female vocal. The music then shifts into a faster rhythm culminating in the action theme of the game. The heavy drums and insistent violin ostinato are overlaid with distorted powerchords and squealing lead guitar lines representing the contemporary edge of the game. This track prototypes the sonic palette of the Esoterrorists mixing elements of rock, orchestra and dance music. You can hear a lower quality version of the track here. Special Suppression Forces: Although much of the Ordo Veritatis work is based on investigation, there comes a time when action is needed and the Special Suppression Forces are called in. This track reflects the overtly military nature of this force and the dangers that they face. The music relies on a lot of very heavy percussion from Japanese taikos and similar instruments but also includes contemporary instrumentation. Eventually the piece closes with a restatement of the main action motif but with even heavier percussion than before. Little Girl Lost: This track was designed to be played alongside the adventureAlbion’s Ransom: Little Girl Lost. The feeling behind the track was to create a mood evoking the urban and spiritual backdrop of this story. There’s clearly a strong trance and trip-hop influence here. Furthermore, the minor harmony and dark instrumentation hint at the underlying peril and mystery. Again a contemporary instrumentation integrates with orchestra, drum loops and voices. The Membrane: The Esoterrorists use the media to help spread fear and weaken the membrane. The music here is suggestive of that influence and is a mixture of percussion, sound design and ambient ideas. Even the main theme is incorporated into this collage of sound although in a twisted manner, sometimes in reverse. Unlike the other tracks to date, The Membrane is specifically designed as background music, to be looped at low levels in the background in times of tension.